I was doing a bit of pruning and noticed my most hated pest. Well the eggs anyways. I've noticed these orange butterfly's hanging around my hops every year. They land on the leaves lay green eggs and take off. When the eggs hatch there are these little crazy looking caterpillars that eat the hell out of the hop plants. Just an FYI for anyone growing hops keep your eyes peeled. What do you do? Spray soapy water? No I'm a crazy purist. I manually pull them off and squishy they're gone. But I think you can use insecticidal soap every time they hatch killing them as soon as they start to feed. But these little fuckers seem to be resilliant so I end up manually killing lots. I'd say your probably safe to spray with whatever your comfortable with until the hops sprout. Just a small update: It's the Painted Lady Butterfly's caterpillar that I have issues with. You can control them but only after they start eating your plants. I guess they need to ingest the poison from the leaves. 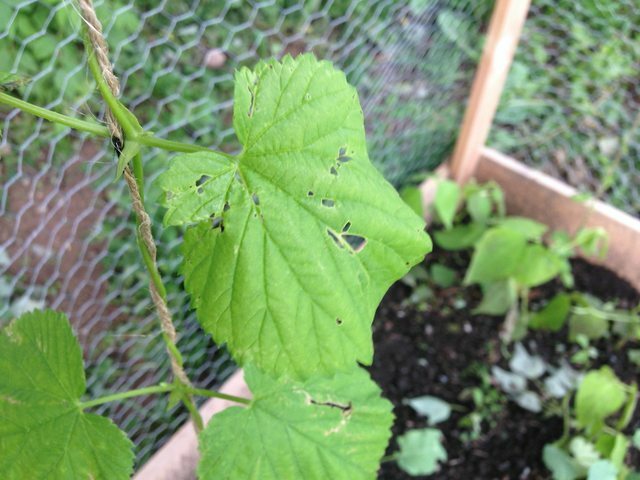 Are these the first pests youve ran in to on your hop plants? Mine just sprouted last week, is there anything I can do preemptively to help prevent anything? Not unless you can stop butterflies from landing on your hops. I've heard if you cut the bottom leaves once they get established/tall that can help against some of the crawling insects. But I haven't tried that yet. They say if they can't get anything to eat on the way up they loose interest and go away. Just keep your eye out you'll be fine. This is a picture of the caterpillars I'm talking about. Also due to the hot humid weather we've been having, the hop aphids and two spotted mites are having a field day. At least with my hops anyways. Keep your eyes peeled. "An once of prevention is worth a pound of hops! " I'm sure they do! Are you coming to the meeting tomorrow I'll bring you some samples. Maybe like a tequila worm. I'm going to patent that idea. Hop worm in the bottle. @Roger my hops are covered in something different. My fault, havent tended to them much... but they are looking doomed. Arthur you took out my hops god dammit! My hops survived Arthur but just in the last few days a few leafs look like they're being munched on. It's nothing major just tiny tiny nibbles and I don't see the presence of any insects. Solution? After all that rain and wind most of the bugs would likely have been blown off. But your best bet is to spray the bottoms of the leaves with a food safe or organic insecticidal soap. That way the soap will not get washed off as quickly and any bugs will have time to kill them and or ingest it. However if you have actual holes and pieces being eaten off you'll probably need to spray for caterpillars and eating bugs soap doesn't seem to do much to stop them BTK is a popular solution. That stuff gets sprayed everywhere. Good luck Arthur made a real mess of my hops. Heres a look at what they look like, I couldnt find any bugs before arthur and its no different now. I'll try the spray, thanks! Something is eating entire leaves now. They're leaving most of the ones on the bottom alone, its the new leaves on top that are disappearing. I can see what looks like a few black ants around the stocks, would ants do that?